Move over food and make room on the menu for racing. The number of runs held each year is on the rise and many organizers have turned to unique themed races to increase the number of participants by offering an experience to remember. Whether you want to enjoy eating chocolate, pizza, cupcakes, just getting dirty with the girls or being your out big gay self, there are multiple opportunities to find a race that suits you. We scoured the world to find five unusual running experiences that will get you fit, make you laugh and most importantly, satisfy virtually any craving you may have. The Dirty Girl Mud Run is exclusively for women (sorry, guys!) that takes runners through a 5K obstacle course. Even if this is your first obstacle run or 5K, the team at Human Movement will help you get to the finish line. The race series has already attracted over 900,000 women of all ages, shapes, sizes and fitness levels. Many runners participate to challenge themselves, connect with girlfriends or to run in honor of a loved one who has lost his or her battle with cancer. Since its debut in 2011, the Dirty Girl Mud Run race series has offered women the chance to run, walk, climb, jump and laugh their way through the muddy course. And the series is constantly adding new cities to its events calendar. Check out their website at godirtygirl.com for details on upcoming races. Who doesn’t love the name of this race series? Big Gay 5K is a series of races held throughout Colorado and runners can participate in Denver, Colorado Springs and Boulder. Race organizers are the first ones to point out that the Big Gay 5K is well, both BIG and GAY! All three races are held in partnership with PrideFest and support local LGBT community centers in the host cities. One important thing to remember is that this race is for everyone. The Big Gay 5K invites walkers, runners, really fast runners, kids, adults, families, gay and straight. So come to run, come to have fun, come to support and come to PRIDE. Sign up for the Big Gay 5K in your favorite Colorado city by visiting spreeracing.com. What would it be like to run 2.5 miles, eat a dozen Krispy Kreme donuts, turn around and run another 2.5 miles? You can find out by running the 12th Krispy Kreme Challenge this winter in Raleigh, North Carolina. The race, which attracted over 7,000 runners and raised nearly $200,000 in last year’s race, is organized by a new team of NCSU students each year. And since its inception the race has raised almost $1 million. Runners eat an estimated 84,000 donuts during the race which costs the race organizers over $20,000, definitely a “hole” lot of money. Interestingly, the race is not affiliated with Krispy Kreme but the group is allowed to use the Krispy Kreme name. The money raised goes to NC Children’s Promise Grants within NC Children’s Hospital. Check them out online at krispykremechallenge.com. The Hot Chocolate 15K/5K is America’s fastest growing race series. The first Hot Chocolate 15K/5K was held in Chicago in 2008 and since then has spread to 13 cities, including Atlanta, Dallas, Nashville and more. 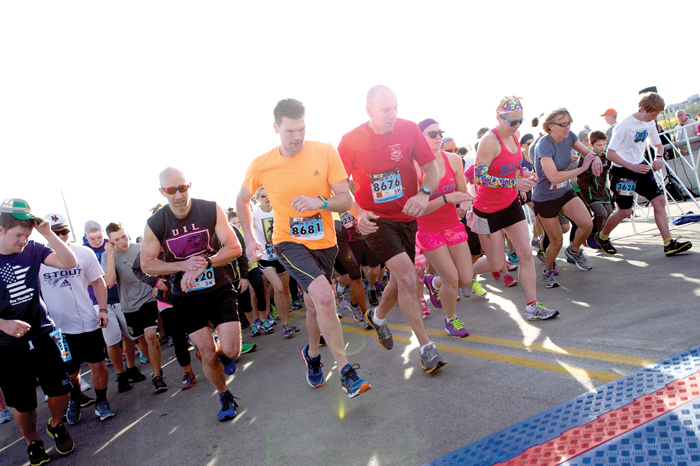 Each race includes two options – a 15K (9.3 miles) and a 5K (3.1 miles) run. The best part? The post-race party where participants celebrate with music, a kid-zone (yes, it even includes a bounce house) and, of course, chocolate. Finishers’ mugs are filled with hot chocolate, chocolate fondue and other tasty treats. The Hot Chocolate 15K/5K partners with Ronald McDonald House Charities, giving you just one more reason to love this race series. The series has earned the nickname “America’s Sweetest Race.” So the real question is where will you run for chocolate? Check out hotchocolate15k.com for a list of cities and race dates. Imagine running two miles and enjoying three slices of New York pizza along the way. That is what participants of the sixth NYC Pizza Run will be doing this September. The NYC Pizza Run takes place in historic Tompkins Square Park. A portion of the proceeds benefit the Juvenile Diabetes Foundation. If cupcakes are more your style then the NYC Cupcake Run is for you. Runners of the NYC Cupcake Run will devour three cupcakes throughout the 5K run through Astoria Park. The local non-profit, New York Cares, benefits from the race. Both races are open to runners of all ages. You can visit the NYC Pizza Run at nycpizzarun.com and the NYC Cupcake Run at nyccupcakerun.com. Photo courtesy of RAM Racing.